Nestled in the Appalachians with Blue Ridge mountain views around every corner, Asheville, NC arguably possesses more natural beauty and culture per capita than any place else in the U.S. The Asheville food scene is nationally recognized; James Beard Award-winning chefs cook in our restaurants and the local mind set says even fried food should be local and organic. With more than 20 open air markets during the week buying fresh organic produce and meat straight from the farm is a way of life. Asheville is recognized as “Beer City, USA” and its dozens of local breweries will quench almost any thirst. 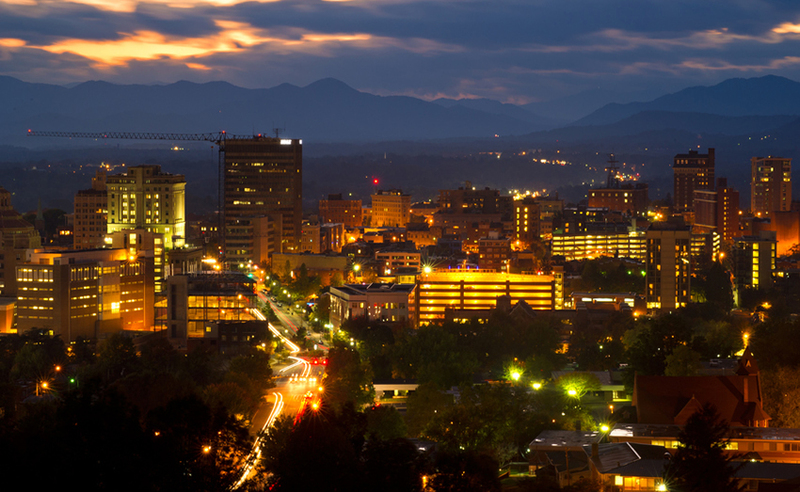 Asheville is home to a thriving music and dance scene. A wealth of venues showcase everything from top 40 musicians to “up and coming” Indie artists. Street buskers & musicians dot the street corners, the Friday night drum circle is a must visit, and art & music festivals, such as Belle Chere. Goombay and , offer frequent free concerts downtown. You can tango, salsa, contra dance, waltz, swivel to the blues and swing the lindy hop or just rock out depending on the evening â€“ all to live bands. The music and dance just doesn’t seem to stop. The arts scene is equally vibrant with fine arts galleries and lofts on every street downtown and throughout the River Arts District. A wealth of arts and crafts festivals showcase the work of local weavers, sculptors, ceramicists, painters, leather workers and other artists in styles and genres that extend far beyond the what you expect in the mountains. Whatever your taste, Asheville artists will satisfy your palate. The mild mountain climate, the abundance of sunshine and the nearness of the Blue Ridge Parkway and the French Broad River, finds many Ashevillians hiking nearby trails, rafting on rapids and relaxing by waterfalls by day, and winding down in the evening at a local brewery, a street cafÃ© or restaurant by the river, or catching the sunset over the Blue Ridge skyline. Living in these mountains is a rare gift, as unique as the town that has been created here.